A simple pumpkin spice latte, made with fresh milk and a pinch of pumpkin pie spice. Make coffee/espresso and set aside. Heat the milk until steaming, then add 1 1/2 tsp sugar, 1/4 tsp pumpkin pie spice, 1 tbsp pumpkin puree and stir well. Slowly add milk to your coffee while stirring. Garnish with whipped cream and a pinch of spice. Serve hot. Note: this can be made dairy-free by substituting regular milk with rice, soy or almond milk. 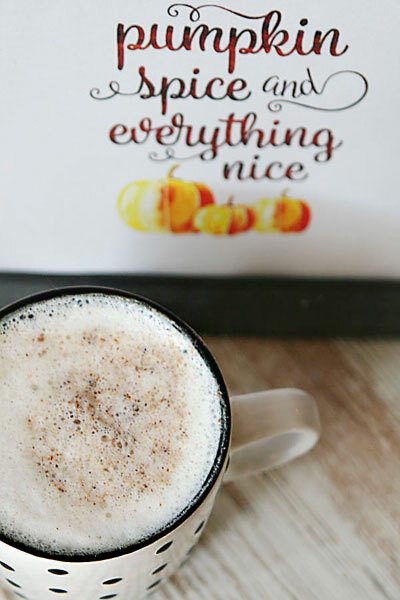 How to make pumpkin spice latte with Keurig? It’s so easy. If you have a Starbucks Verismo machine, then grab this Verismo pumpkin spice latte recipe. For times when you only need a splash of fall flavor and you don’t want to do any extra work, you can use store-bought options like a liquid pumpkin pie spice creamer, pumpkin spice k-cups or ground coffee. However, most of these are seasonal and are only available for a limited time (fall/ winter). Enjoy your homemade pumpkin spice lattes! I made this without the coffee – used 1 cup milk instead – for a treat for my kids. They love pumpkin spice too.